In the last few days of July 513 BCE, a clerk at the White House at Sippar pressed a receipt into the clay. The four soldiers who were waiting for their supplies must have been impatient, because he backdated the receipt four months (Nisannu overlapped with modern March and April, Abu with July and August). He certainly wrote in a compressed style with simple forms of signs and many logograms. By careful comparison with other texts we can reconstruct most of his meaning. In this period Babylonians spoke of active military service as time “in the military camp” (ina madakti). Expressions like English “on campaign” “at the encampment” or Latin in castro and sub pellis have similar connotations. It is not clear where the king’s camp was located in 513 BCE, but three years’ service was more than enough time for several changes of plan. Perhaps the most colourful expression is rikis qabli, “girdle of the loins.” In administrative texts it meant the equipment which someone needed to be ready to fight. Since the Babylonians had discovered that money and goods were interchangeable, the expression sometimes meant the equipment itself, sometimes money to buy equipment, and sometimes both. The Ebabbar seems to have bought the donkey for cash, given money to buy fodder, and provided clothing out of its storerooms. “Gird your loins” is familiar to English speakers from the King James Version. Translators who prefer to render Akkadian into modern bureaucratic English sometimes use a phrase like “military equipment.” An expression like “outfit” with its suggestions of the Gold Rush might just work. The donkey is bought for cash, but no tack or saddlebag is listed. Neither are any riding horses. Cavalry have generally been accompanied by pack animals to carry equipment and supplies and prevent the warhorses from being worn out, although too many beasts slowed the army down and devoured the fodder too quickly. The exact ratios can vary widely, from one pack animal per several cavalry in the most austere armies, to several horses per soldier in the most ponderous. It is not completely clear whether the first name was deliberately erased by the scribe or crumbled away before Strassmeier could sketch it. In his sketch it seems to begin with the sign “AN” unlike all of the names which follow. If we understand this as equipment for four men for three years, then the multiples of 12 are logical: each horseman was allowed two garments, a leather sack, and a pair of shoes per year. One change of clothing per year was not few in the ancient world: Cato the Elder recommended giving slaves a new tunic and blanket every second year (De Agricultura 59) although there may be evidence for more frequent issue in the Roman army. Surprisingly, no money for provisions and no staple food is provided. Nor are weapons or horses given. Perhaps these troopers provided them themselves, or perhaps they had already been issued. A PI is 36 QA which are usually equated with a liter. When it refers to dry goods the sign PI is sometimes translated with “bushel”, when wet goods with “jar.” I have left these measures with their logographic, Sumerian names rather than give Babylonian equivalents which are just as vague as pint, jar, or bushel. A Babylonian mina or pound is 60 shekels, and it was a truth universally acknowledged that a shekel’s weight of silver ought to be enough to support a labourer and his family for a month, even if the prices in the market at Babylon had not cooperated for many centuries. Although arithmetic exercises and labeled measures give modern scholars a fairly good understanding of Babylonian weights and measures, earlier periods and more remote areas leave plenty of room for scholarly debate. The coats are sirˀam discussed before on this blog. These are labeled with the determinative for CLOTH so they are probably textile. The caps are called karballatu a foreign word for a piece of headgear. In lists of lands they are worn by the Pointed-Cap Saka. Both garments could be cheap and of thin cloth or heavy and of leather, iron, or bronze. The mountain garments or TUG2.KUR.RA are even more confusing, since their name is written logographically and it is not known how it was pronounced. Other references to them as being large, rectangular, and weighing three to eight minas each suggest that they were cloaks or blankets. Records of military service from Babylonia in the “long sixth century” from the destruction of the Assyrian kingdom (sometime between 612 and 614 BCE) to the interruption of records after the Babylonian revolt against Xerxes in 484 BCE tend to be mainly concerned with its financial aspects. The clerk’s business was to account for all outflows of money and goods from his department, not to record what happened afterwards. As our clerk puts this tablet in the sun to harden, and the four troopers and their donkey turn to go, we can wish them luck on their adventure into the unknown future. Further Reading: For a sketch of the tablet, see here. For a transcription see Achemenet. For a transcription and French translation, see Francis Joannès, Textes économiques de la babylonie récente (Études Recherch sur les civilisations: Paris, 1982) p. 18. For an English translation, see Amélie Kuhrt, The Persian Empire: A Corpus of Sources from the Achaemenid Period (London: Routledge, 2007). On the TUG2.KUR.RA, see A. Leo Oppenheim, review of H.H. 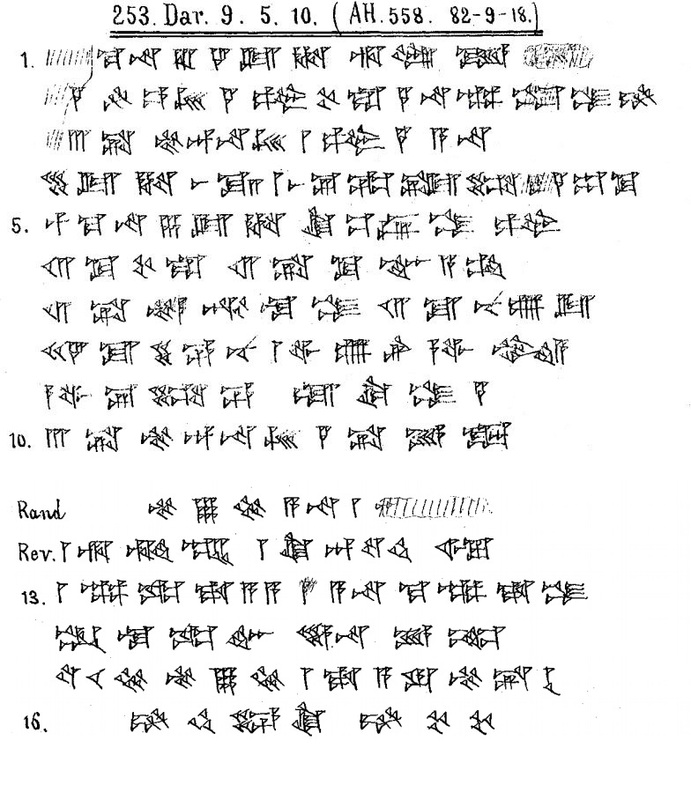 Figulla, “Business Documents of the New-Babylonian Period,” Journal of Cuneiform Studies 4.3 (1950) pp. 188, 189. As the alert reader will note, there are many more scholarly tools available to help with these texts than some writers suggest. I wonder if the 4 month delay had any similarity to the difficulties Union Soldiers had getting uniforms and weapons, at least in the early stages of the Civil War. A PBS documentary that touched on the Sultana tragedy mentioned President Lincoln personally intervening to reinstate corrupt and incompetent quartermaster General Reuben Hatch. Perhaps some things remain an eternal struggle within military organizations. It could be. I think that one reason it is important to look at different times and places is that more recent and better-documented ones can suggest ways to fill in the story behind what survives from earlier and less documented ones.